The Hawaii State Legislature is the state legislature of the U.S. state of Hawaii. The state legislature is a bicameral body consisting of a lower house, the Hawaii State House of Representatives, with 51 representatives, and an upper house, the 25-member Hawaii State Senate. There are a total of 76 representatives in the legislature, each representing single member districts across the islands. The powers of the legislature are granted under Article III of the Constitution of Hawaii. The legislature convenes at the Hawaii State Capitol building in the state capital of Honolulu, on the island of Oahu. The legislature is a descendent of the two houses of the parliament for the Kingdom of Hawaii, the Legislature of the Hawaiian Kingdom, created in the 1840 Constitution of the Kingdom and continued in the subsequent 1852 Constitution as the Legislature of the Hawaiian Islands, consisting of the House of Representatives (Hawaiian Kingdom) and the House of Nobles. Following the overthrow and fall of the Kingdom in 1894 this Legislature became the legislative body of the briefly established Republic of Hawaii, and shortly afterwards under the newly organized Territory of Hawaii following the annexation by the United States in 1898. 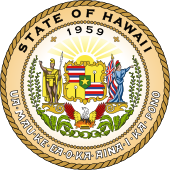 The current Hawaii State Legislature was created following the passage of the Hawaii Admission Act by the United States Congress in 1959 when the Territory of Hawaii was admitted to the Union as the 50th State. The 51 members of the House are elected to two-year terms without term limits. The 25 members of the Senate are elected to four-year terms, also without term limits. Like many other state legislatures in the United States, the Hawaii State Legislature is a part-time body and legislators often have active careers outside of government. Members of both houses vote to select presiding officers from within their ranks, such as the Speaker of the House and the President of the Senate. These positions are customarily held by members of the majority party in each chamber. The Lieutenant Governor of Hawaii, who also serves as Hawaii's equivalent of a Secretary of State, is entirely removed from the legislative process. Each session of the state legislature lasts for two years, starting in each odd year. Article III, Section 10 of the Hawaii Constitution states that the legislature must convene annually in regular session at 10:00 o'clock a.m. on the third Wednesday in January. Regular sessions are limited to a period of 60 working days, which exclude Saturdays, Sundays, holidays, and designated recess days. The practical effect of having a two-year session is that any bill introduced in the first (odd-numbered) year which does not pass may be considered in the second year at the point in the process where its progress stopped. At the end of the biennium, however, all bills that did not pass the legislature die and to be considered must be reintroduced anew in the following session. Article III, Section 7 of the Hawaii Constitution state that members of the Hawaii Senate must have been a resident of Hawaii for more than three years, have attained the age of majority and must, prior to filing nomination papers and thereafter continue to be, a qualified voter of the senate district from which the person seeks to be elected. An exception to this rule is that in the year of the first general election following district changes, but prior to the primary election, an incumbent senator may move to a new district without being disqualified from completing the remainder of the incumbent senator's term. Members of the Hawaii House of Representatives must also have been residents of Hawaii for more than three years, must have attained the age of majority, and live in their respective house districts. The Hawaii State Legislature was moved to the Hawaii State Capitol in the Capital District near downtown Honolulu on March 15, 1969. The legislature moved temporarily to adjacent Capital District facilities when the Capitol was closed for four years in the 1990s for asbestos removal. The legislature moved back to the Capitol for the 1996 session. Prior to Governor John A. Burns's decision to build the new Capitol building, the Hawaii State Legislature met at ʻIolani Palace.